Creekstone Press is situated on Witsuwit’en territory. 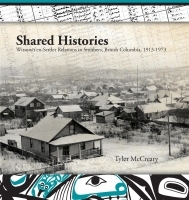 Three of our more recent books – Song of the Earth, Shared Histories and Mapping My Way Home: A Gitxsan History reflect our commitment to truth and reconciliation which began back with our first publication, Canyon Creek: A Script. In that spirit, we are proud to come out in support of efforts for reconciliation and against the invasion of Witsuwit’en house territories on the Widzin Kwah (Morice River) by the RCMP. Since our first book came out in 1998, we have published non-fiction, fiction, poetry, photography and painting, and featured writers and artists from northern BC. We are proud to be celebrating our 21st year in business.